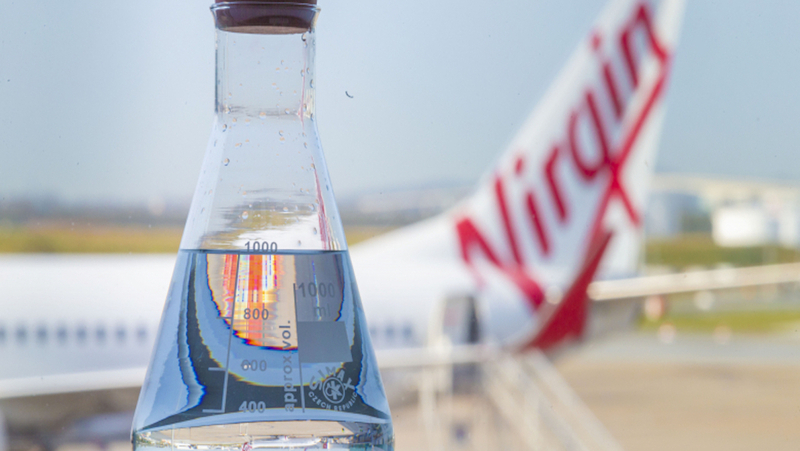 Virgin Australia says it has operated 195 flights out of Brisbane powered by a blend of traditional jet fuel and aviation biofuel delivered via the airport’s regular fuel supply system. The flights, which spanned 430,000km and covered both domestic and international routes, were part of a trial involving the airline, Brisbane Airport, the Queensland government and fuel supplier Gevo, as well as Caltex and DB Schenker. Virgin Australia said in a statement it was the first time in this country aviation biofuel, or biojet, made from sustainable sources such as sugarcane bagasse, molasses, wood waste and agave, had been supplied through an airport’s regular fuel supply system. Brisbane Airport was named as the host of the trial in October 2017. 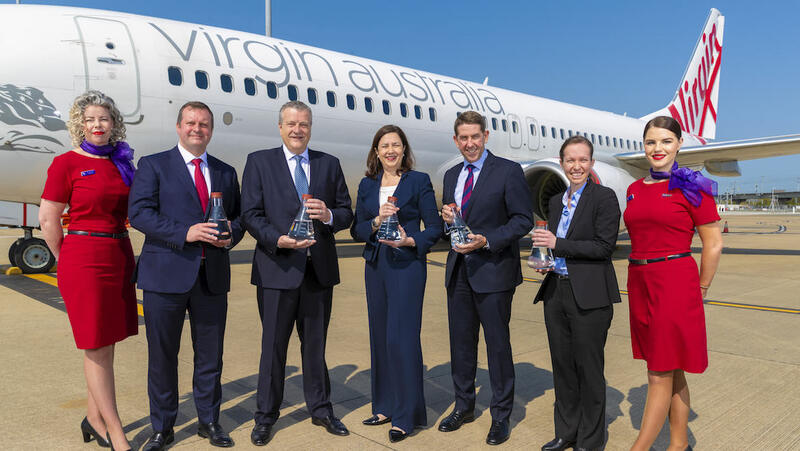 On Tuesday, Queensland Premier Annastacia Palaszczuk joined Virgin Australia group executive for airlines Rob Sharp and Brisbane Airport chief executive Gert-Jan de Graaff to announce the success of the trial. “We recognise that there is a great opportunity to develop a thriving sustainable fuels industry, which will help to reduce emissions and drive investment and jobs growth in Australia,” Sharp said in a statement. Premier Palaszczuk said she hoped the trial would spur efforts to develop a local biofuel industry. “This is another step forward in a homegrown biofuels industry – one that my government is supporting,” the Premier said. Airlines are already flying with biofuels – those are big customers. Now for a #Queensland #biofuels industry to supply them – it's on its way! Queensland Premier Annastacia Palaszczuk discusses the Brisbane Airport biofuel trial on her Twitter page. In October 2016, an overwhelming majority of the International Civil Aviation Organisation’s 191 member states agreed to the Carbon Offsetting and Reduction Scheme for International Aviation (CORSIA). Further, 73 nations, including Australia, New Zealand and Papua New Guinea in this part of the world, have agreed to be part of CORSIA from the start. The landmark agreement has among its targets for the industry to achieve carbon neutral growth by 2020, in addition to a 50 per cent reduction in CO2 emissions by 2050, compared with 2005 levels. ICAO has also come up with a CO2 emissions standard, where aircraft will have to meet a maximum fuel burn per flight kilometre baseline which must not be exceeded. The standard would apply to new aircraft designs from 2020, while new deliveries of current in-production aircraft models would be subject to the CO2 standard from 2023. Further, the ICAO measure also recommended a cut-off date of 2028 for production aircraft that did not comply with the standard. Moreover, the International Air Transport Association (IATA) has set a target of an average improvement in fuel efficiency of 1.5 per cent per year from 2009 to 2020, as well as aspirations to build an aircraft that produced no emissions within 50 years. Air transport accounted for about two per cent of global man-made CO2 emissions. The figure has been relatively constant over the past 20 years and was not expected to increase beyond three per cent by 2050. Figures from the IATA annual general meeting held in Sydney in early June showed there had been about 100,000 flights taken with sustainable aviation fuels since the first test flight in 2008. The figure was likely to hit one million by 2020. IATA said it hoped to have one billion passengers fly on some blend of sustainable aviation biofuel by 2025. It would be interesting to know how our airlines’ current fleet measure up to the forthcoming CO2 emission standards. Since it’s measured by max fuel burn per flight kilometre, rather than per seat-kilometre, this would seem to discriminate against large aircraft. E.g. will this force retirement by 2028 of A380s? OK, Qantas’s might be due to be replaced by then anyway, but Emirates in 2028 will have some frames are just 4 years old. What about AN-224 and 747-200 freighters? Now this gives Australian Cane growers enormous opportnities, given the support they will be needing from the Australian government, from all sides of political persuasions. Let them not lose this great opportunity, to keep the cane industry vibrant, and ever growing, pun not intended.